Professor Erno Rubik (Rubik's cube game percipta) was born on 13 July 1944 padea in the city of Budapest, Hungary was an inventor as well as the creator of the Rubik's cube games or commonly called magic cube known throughout the world. Erno Rubik teaching in architecture and interior design (Department of Interior Design at the Academy of Applied Arts and Crafts) in Budapest when he created what is now known as the Rubik's Cube puzzle three-dimensional that became a sensation around the world at the beginning of the year 1980. Rubik studied architecture and design at the Academy of Applied Arts and Crafts in the late 1960's. He took a job as an instructor there, and outside of work hours he worked to build a model three-dimensional cube design. At the time of teaching, Erno Rubik prefers to use real models made of paper, cardboard, wood or plastic to communicate / explain the idea to the students, so the explanation can be better understood and can be easily remembered by the students. The first working prototype of the cube is completed in 1974, and he filed for a patent on the design in early 1975. puzzles are made up of smaller cubes, each cube color (3 x 3 x 3) which can be manipulated by the player horizontal and vertical plane. In the "pure" form, six cubes - made up of nine squares - the yellow, white, orange, blue, red and green. Once the cube has been manipulated, getting the set back to its pure form is not so easy. 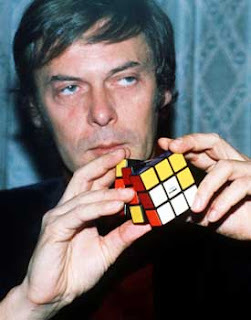 According to present knowledge, Erno Rubik takes about a month to solve the puzzle of the game cube which he created himself. And it took a few years in preparation for mass production prototype, finally in 1977 the first Rubik's toys sold in toy stores in Budapest. Because Hungary was still isolated iron curtain in the late 70's, the market starts moving up. The efforts of two Hungarians living abroad who brought toys to the West, long after the game was endemic in Budapest. A Hungarian worker who works in Vienna, "discovered" this toy while on duty in Budapest and trying to find a realtor toys in Germany. Eventually he even met with Tom Kremer, toy inventor who was born in Hungary who is based in London. The two men ended up creating a marketing plan, and ultimately get the approval of one toy company executive who immediately ordered 1 million seeds First sales and popularity exploded in Europe, despite the lack of marketing or advertising campaign. In 1980, the Rubik's Cube game was introduced to the United States and around the world and dubbed "Rubik's Cube." Toys that have sold millions and attracted the attention of mathematicians and others in the academic community, but also become a competitive event in 1982, when Budapest hosted the first world championship (Vietnam Minh Thai won, solve the puzzle in under 23 seconds ). Although the "craze" lasted only a few years, the Rubik's Cube is now a standard toy store and has spawned dozens of imitations and spin-offs. Rubik become one of Hungary's richest businessmen and continue to develop more games and puzzles, including Rubik's Revenge (4 x 4 x 4 cube) and Rubik's Snake. For many - years Erno Rubik continue to work to produce the toy in 7 cities and continue - constantly trying to make games - games and puzzles. And now many types of Magic Cube that has been circulating, there are 2 × 2, 3 × 3, Mirror Block Cube, etc., and also has much to finish this puzzle game ... maybe including you. And also has many born speedcuber and current record holder is: Erik Akkersdijk second with a time of 7:08. The fastest record in solving Rubik's Cube (Record Indonesia) successfully printed the anniversary event MURI (Indonesian Record Museum-World) on January 31, 2007 at the Grand Temple, Semarang. Record time is 19.33 seconds, which was recorded in the name of Abel Brata Susilo. World record in solving Rubik's Cube blindfolded successfully printed at Jakarta Open 2010 competition on January 31, 2010 at FX Building, Jakarta. 3x3 Rubik blindfolded highest number is 16 pieces in 57 minutes completed on behalf of Muhammad Iril of Indonesia. Previously held the world record category Tong Jiang of China with 15 Rubik's cube. Not only Muhammad Iril, Indonesia also placed third in the men's race the world record by completing 11 Adi Wicaksono Rubik's cube without looking in 55 minutes 10 seconds. Wicaksono record broken at Indonesia Open 2009. All of the record was recorded in the World Cube Association (WCA).